In December, 1990, Michigan biophysicist Wm.C. Levengood contacted Pat Delgado (one of the very early British crop circle investigators), expressing an interest in examining plants taken from crop circles (samples) and comparing them with plants taken elsewhere in the same fields (controls). Mr. Delgado began shipping crop circle plant samples and controls from various British crop formations to Levengood's Michigan laboratory and, almost immediately, Levengood began observing anomalies in the circle plants: the seeds from many of the crop circle plants were visibly smaller than the controls, and weighed less -- in one case, although the seed-head and glumes appeared basically normal externally, when the glumes (tissue surrounding each seed) were opened they were found to be devoid of seeds altogether. This was a highly unusual finding in a wheat crop planted for commercial harvest. At this early stage of investigation Levengood pursued various experimental evaluations, some of which were non-productive, others of which began to form the basis of a consistent description of characteristic changes in crop circle plants. He had begun to document abnormal enlargement of the growth nodes in the circle plant stems, and seed-germination studies were revealing clear alterations in the normal development of the seedling embryos, indicating interference in the reproductive capacity of the circle plants. 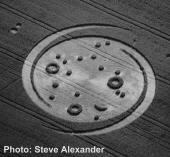 It was obvious that something unusual was affecting these crop circle plants -- the question, of course, was what? By 1992 John Burke, a New York businessman with a strong avocational interest in geomagnetic and electromagnetic theory, and Nancy Talbott, a music producer with a research background at the University of Maryland and at Harvard College, had both become interested in the crop circle phenomenon and had contacted Levengood about his crop circle research. Excited by the early laboratory results and Levengood's conviction that something highly unusual was taking place in the crop fields, Burke and Talbott were interested in assisting the research effort and an informal collaboration -- the "BLT" (Burke, Levengood, Talbott) Research Team began to take shape. By now crop formations were being reported in countries around the world and it was apparent that an organized international reporting and field-sampling network was needed. Talbott set about creating these networks in order to obtain samples from newly-discovered formations; she developed a concise field-sampling protocol, located and trained new sampling personnel, arranged for the shipping of plants and soils to Levengood's Michigan lab, and financed the attendant expenses. Burke worked on the theoretical ideas emerging from Levengood's laboratory data, spending considerable time in NYC libraries researching the scientific literature. Together Burke and Talbott carried out various field experiments in the U.K. and networked with other researchers so as to stay informed of any new developments in the phenomenon. Over the next eight years a significant number of crop formations (approx. 300) were sampled in seven countries -- the U.S., Canada, England, the Netherlands, Germany, Australia and Israel. Field-trips to sample circles and gather on-site data in the U.K., Germany, Canada, The Netherlands and the U.S. were undertaken by Ms. Talbott each summer, and dozens of other crop circles were documented and sampled by the growing number of new field-workers. Control studies were designed and carried out and thousands of hours of field, office, library and laboratory work were expended. Laboratory reports on individual cases were written up and mailed out to land-owners and farmers around the world, as well as to the fieldworkers involved in each event and to local media. In 1993 a crop formation at Cherhill, England which had occurred during the annual Perseids meteor shower, had been found with a glaze of very pure iron covering -- and embedded in -- some of the downed plants. 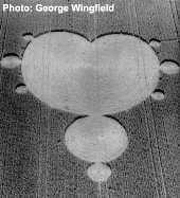 Following this discovery, regular soil sampling was instituted and carried out on most crop circles studied subsequently. The results of this early work were clear and thought-provoking: there are pervasive, re-occurring abnormalities in crop circle plants and soils (as compared to the control plants and soils taken from the same fields and as compared with plants evaluated in the control studies) which are consistent with exposure of these plants and soils to an intense and complex energy system which emits heat (possibly microwaves) along with highly unusual electrical pulses and strong magnetic fields. Of the 300+/- crop formations sampled by the BLT Team and examined by Levengood from 1990 through 2000, more than 90% showed the characteristic anomalous changes in somatic (non-reproductive) and/or reproductive plant tissues, and magnetic material was consistently documented in those formations where soil sampling had also been conducted. Three research papers were written during this 10-year period and published in peer-reviewed scientific journals (see "Published Materials"), establishing in the scientific literature for the first time that the "human pranksters with planks and boards" theory of crop circle causation was inadequate -- and that something much more intriguing is going on. The BLT Team has never been able, financially or logistically, to sample every formation reported in every country around the world each summer and, therefore, cannot extrapolate precise figures regarding this "man-made/real" debate. Our work is, however, the most comprehensive to-date, our choice of formations to be studied purposely random within each country, and we have utilized hundreds of different fieldworkers, a majority of whom were totally unacquainted with each other and often equally unaware of lab results previously obtained. These facts strongly argue against bias on the part of the field-teams, as does the fact that 90+% of the formations evaluated in the lab -- regardless of country or field-personnel involved -- reveal the same plant/soil abnormalities we now associate with the real phenomenon. The fact that the various testing procedures have shown high correlation with each other helps rule out experimenter-bias, and the control studies have clearly established the fact that manually-downed crop (using planks and boards, human feet, and a cement roller) does not exhibit the physical changes observed in crop circle plants over the years. It seems probable, then, that the overall number of man-made crop circles is relatively small, compared to the total number of circles discovered and reported each year. It should also be emphasized that our contact with landowners and farmers indicates that many crop circles go unreported each year, either because they occur in very remote areas and are never discovered at all (crop circles occur in all kinds of plants, not just cereal crops) or they are found at harvest by farmers who are either uninterested in reporting them or unaware of the reporting network. Furthermore farmers whose land has been farmed by generations of the same family regularly report that previous generations did occasionally report the discovery of crop circles while harvesting. In 1999 an opportunity to carry out some new research presented itself when New York philanthropist Laurance S. Rockefeller offered funding. In order to meet Mr. Rockefeller's requirements Ms. Talbott sought and was granted non-profit, tax-exempt status, and BLT Research Team Inc. was created, with Ms. Talbott as President. For several years Ms. Talbott had been encouraging the interest of several scientists, with differing expertise, in the crop circle situation and it was through one of these -- Utah geologist Diane Conrad -- that a new investigatory approach to the phenomen was instituted. In 1996 Ms. Conrad, then a resident in Utah, had carried out X-ray diffraction analysis on soil samples retrieved from a crop circle in Providence, Utah. Her very preliminary examination seemed to indicate that an in-depth XRD evaluation of crop circle soils might be productive, and this project was subsequently carried out with the Rockefeller funding. A new scientific paper presenting the results of this study is in progress and will be published, we expect, in 2002. Slowly, as new scientists learn of the research results obtained so far and begin to recognize some of the implications, the BLT Research Team Inc. is adding to its list of consultants. Although the media has made this progress more difficult by labeling the crop circle phenomenon as "fringe," hard data -- obtained through rigorous scientific methodology -- is difficult to ignore. As one prominent consultant recently replied, when asked if he was concerned about possible skepticism from his peers, "the data is the data." And following such data wherever it leads will most likely lead us, eventually, to an understanding of this most enigmatic, peculiar phenomenon.